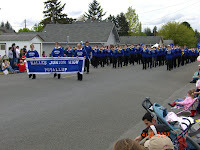 Nic was in the Daffodil Parade on Saturday, marching with the rest of the Junior High band students. No matter how many times I got a picture I was unable to get a smile out of him. He did acknowledge me with a quick glance in my direction though. This was his first and probably last parade. He has decided not to continue band next year so he can pursue other electives (weight training & conditioning), wonder where that came from STEVE!!! 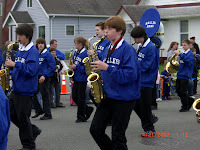 As I look back I remember I stopped band after 7th grade. I liked it but we also move to Texas over the summer & not knowing anyone, I didn't want to continue on with it. At least Nic is able to read the music. I never learned but had an ear for what we were playing. Look at how tall he is getting. He has passed both of us and is moving up & up. I had to buy him size 11 shoes the other day. 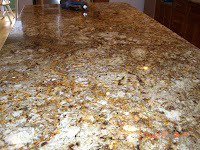 The kitchen granite was installed over the weekend & just finished up this morning. 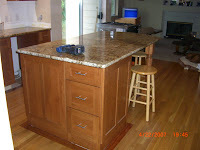 It will be so great to have a full working kitchen by this evening. The sink will be there & we can run water. The stove will be all hooked up & we will have a dishwasher. All that will be left of the kitchen will be the tile backsplash, toe kicks on the cabinets & crown molding on top of the cabinets. How amazing is that?! I shudder to think how people lived their lives many years before us without all this great stuff. They were far stronger than I!!! We have new carpet installed & Steve has installed hardwood in the office. The lights have been replaced & we will be painting new doors & trimwork. That includes baseboards, door & window trim for the entire house!!! I love painting, I love painting, I love to paint!!!!!!!!!!!!! Yaha right. We hope to be mostly done by the end of May. In that estimate we are including more dirt & sod for the backyard. We will just have the deck to build last. He is getting so tall...I cannot believe it. 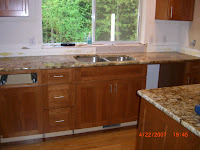 Your kitchen looks great! You guys have done a really great job!